For those of you following the WIES blog, you’ve become familiar with the contributions of our Fall Intern Elise Steinberger. An aspiring science writer, Elise joined us this semester to learn about coastal and marine biology before beginning her graduate studies, and blogged about her time with us along the way. With this final post she now heads home to begin her Masters program. We wish her safe travels and good luck! Every morning the Miss Christy comes in, and every evening it leaves Little Harbor just before the sun. The number of people that come and go each day is astounding – some stay for a day, others for a week, and still others for months. 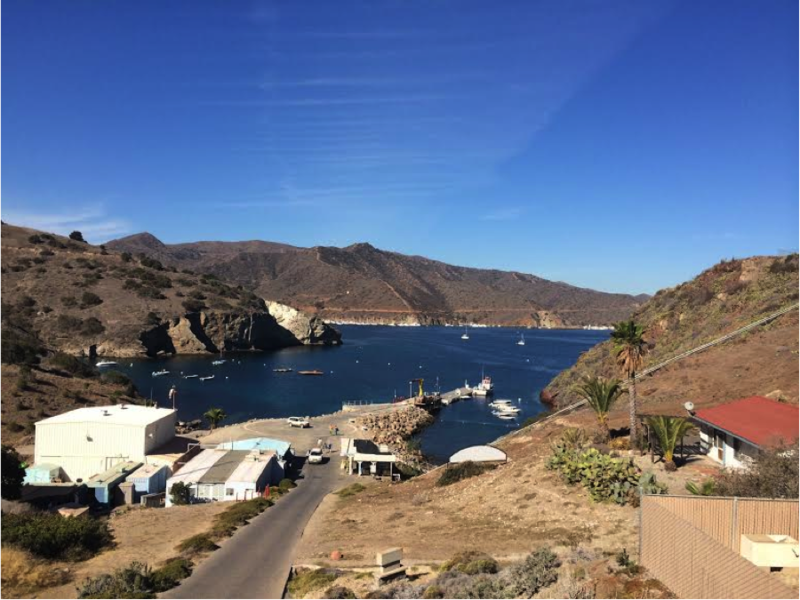 Researchers, students, and even filmmakers have various reasons for spending time on Catalina. 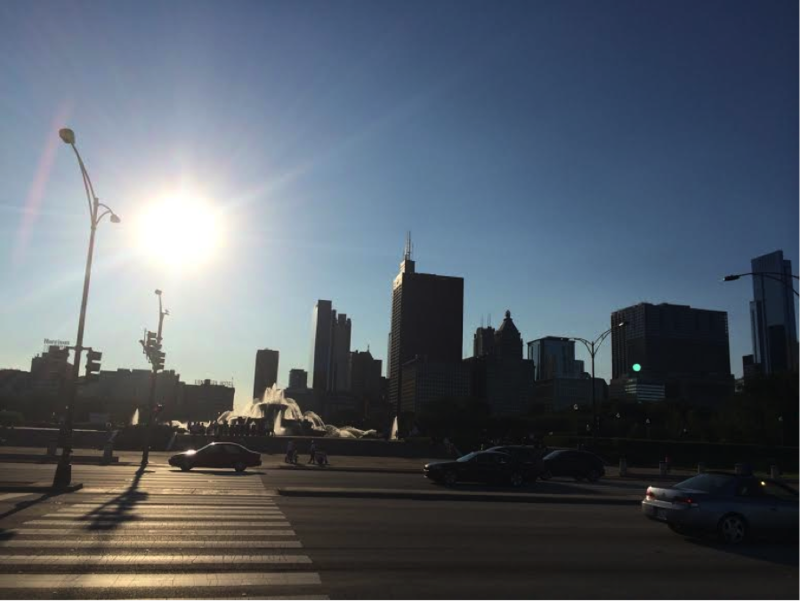 As I think about returning to Chicago, I reflect on how different life is in the two places. The tight-knit community that welcomed me on my first day on Catalina will soon become a pleasant memory, as I return to where you are perpetually immersed in a sea of strangers as you walk down the street. Grant Park in Chicago, on a sunny day. When I tell friends and family about my internship at the Wrigley Marine Science Center, everyone asks how that happened. The truth is that it all started with a simple email. I have always been fascinated by marine science and, after studying Biology at Northwestern as an undergraduate, my interest in climate change and conservation had consistently grown. This curiosity was coupled with my desire to work internationally at the intersection of environmental and social issues. For this reason, before beginning my Masters in “Health and Science Writing and Reporting” at Northwestern, I wanted to spend time at the Wrigley Institute – in order to better understand how marine scientists and marine institutes operate and how they fit into the puzzle of current global issues. I sent an email to the Wrigley Institute describing my interest in their research and how I planned to use the experience moving forward, and was invited to be an intern for the Fall Semester. Coming to Wrigley as an intern, I was excited to be involved in any way possible. And I was. I had the chance to talk with marine science experts in various fields as well as diving experts, hyperbaric chamber volunteers, marine biology students, and budding young high school science students. With so many groups coming to the island and events going on, every week was different. Because of this, I didn’t have a ‘typical day’ (aside from feeding the sharks, oysters, and other creatures every morning). The Wrigley Marine Science Center, my home away from home. This entry was posted in Wrigley Institute on December 19, 2014 by Jessica Dutton. It’s 8:00 a.m. and breakfast has just ended at the Wrigley Marine Science Center, at the tail end of the Fall semester. Griffin, Sam, and Russell head down to the waterfront for yet another dive; Lorna and Alexis hop in a boat to collect another day’s worth of plant and abalone data; Ali walks down the ramp into Little Fisherman’s Cove in search of guitarfish; Geoff meets with waterfront staff to fashion a contraption capable of producing sound underwater; Alexa and Ashley check on their tanks of crabs and anemones. Just some of the many students finishing up on research projects in labs and in the field. These California State students have been living in dorms at the Catalina Island campus for their entire fall semesters. Some are completing their undergraduate degrees, while others are beginning Master’s programs. They have shared countless meals together in the dining hall, movies in the lounge, and hours in the classroom. 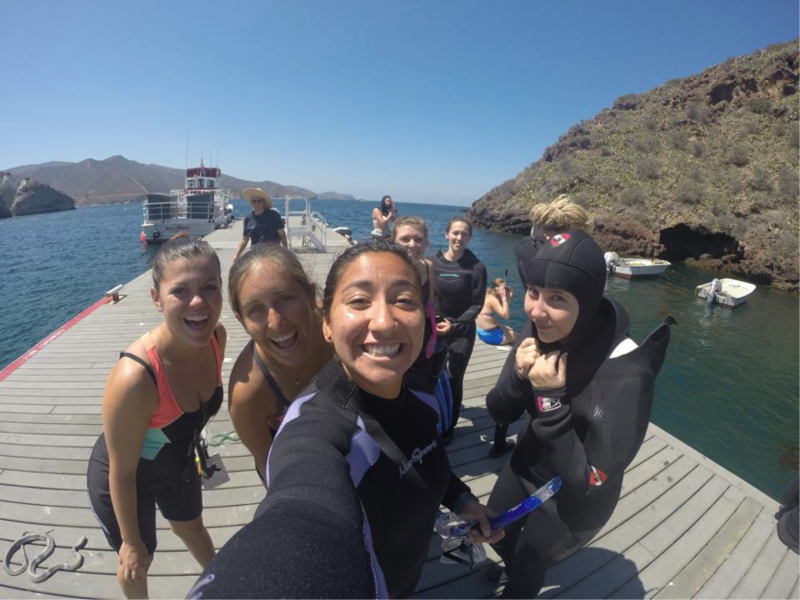 The “Cal State Catalina Semester” is a program for students throughout the Cal State system, offering an opportunity to come together for a combination of classes and fieldwork at Catalina Island. With finals and lab practicals behind them, the students now focus on finishing the data collection necessary to complete their final research projects. As a WMSC Intern this fall, I’ve had to chance to tag along on many of their experiences. I accompanied Alexis on a few data collection trips where we took a boat to Lion’s Head to survey abalones in the area. 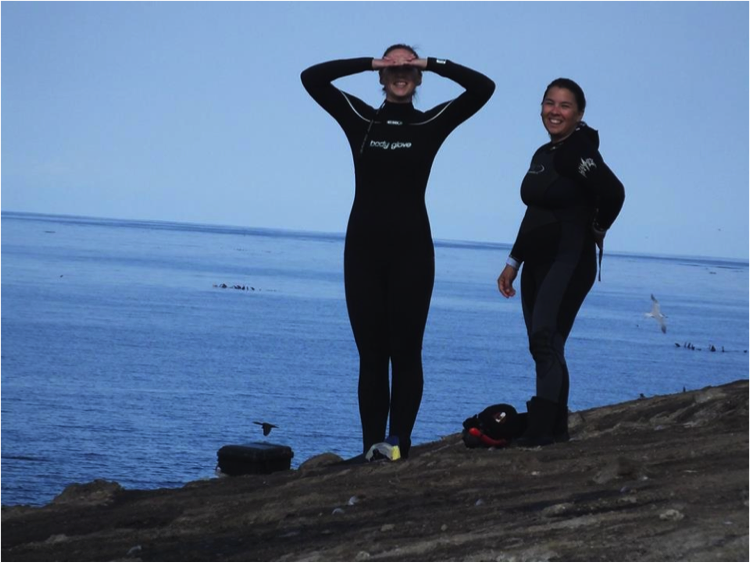 In my 3mm wetsuit, fins, and mask, I watched as Alexis free-dove in 10-15 feet of water to measure abalone shells. The rough surf was a challenge, and I watched our nearby moored boat bob in the waves as Alexis fought to maintain her position in the water over her transect line. After about an hour in the water, the cold from my hands and feet began spreading. I marveled at the fact that Alexis was not using a wetsuit; but then again, with the amount of free diving she was doing, if she were on land she’d likely be working up a sweat. Another day, I bumped into Ali while snorkeling in Little Fisherman’s Cove. She was there trying to find – and film – guitarfish for her research on their behavior. Visibility was not good (for Catalina Island standards…) and she was having trouble finding any guitarfish. I offered to help search and, after swimming around for some time, we finally found a few. Ali promptly dove, gripping her underwater camera with both hands as she descended. After surfacing, she joked about being cold regardless of the multiple wetsuits she was wearing – a regular challenge as her research requires that she be as still as possible in the water, so as to not startle the guitarfish. Later, at dinner we all had a good laugh as Griffin described what he found on his dive: sea urchins escaping from holes he cannot seem to locate in his experimental ‘boxes’ he painstakingly constructed and set under water. 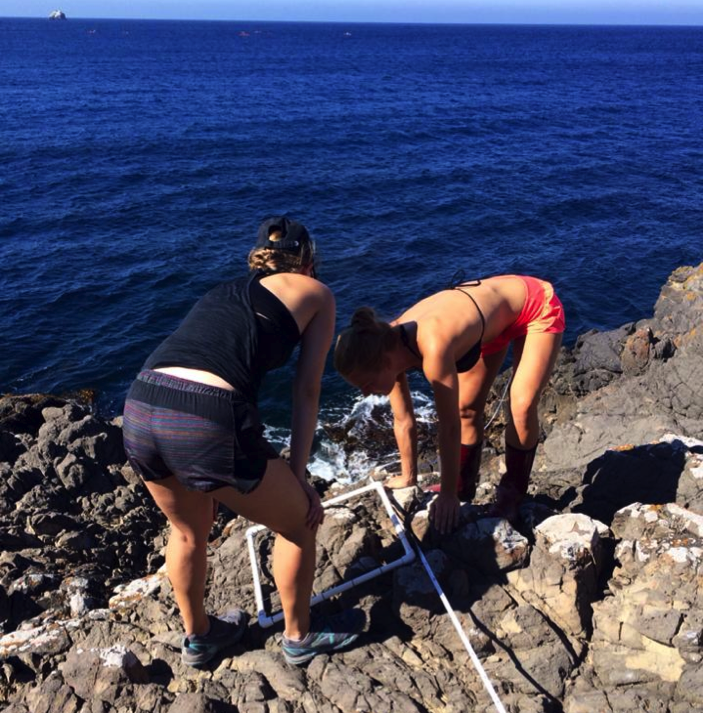 Meanwhile, Alexa discussed how her crabs were not cooperating with her experimental set-ups in the labs, and Sydney explained the process of tracking the dives of cormorant birds. Though each project has its unique set of challenges, students collaborate to problem-solve and help each other collect data to complete their research projects. Now that its the end of the semester, the students will disperse. They will return to their respective universities across California, taking with them this special research experience. Perhaps, in a few years, some will ride the tide back to Catalina as experts in their fields. Safe travels! Elise Steinberger is a fall intern at the Wrigley Marine Science Center, here to learn more about marine science before beginning her Master’s in Health and Science Writing at Northwestern University. This entry was posted in Wrigley Institute on December 12, 2014 by Jessica Dutton.